“The domestic help who was employed a few days ago insisted on sleeping inside the house, which had scared my mother, who doubted his intention. I never thought my mother’s suspicion will turn out to be true”, said the victim’s daughter, Shefali Saini. The Chandigarh Police will be sending the “explicit picture” of UT Deputy Commissioner (DC) with a woman to the Central Forensic Science Laboratory (CFSL) for investigation. Unaware of the two-day shutdown at the Chandigarh Airport, commuters reaching here had tough time arranging for alternative means of transport today. 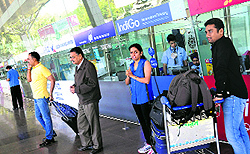 Many commuters at the Chandigarh Airport alleged that the respective airlines, in which they were schedule to travel, failed to convey the message regarding the shutdown of services to them. The Vimal murder case took yet another turn today when his wife alleged that her 28-year-old husband was impotent and that she was too embarrassed to have undergone a divorce for the fouth time. She also reportedly told the police Vimal was married for a third time. Recording his statements before the Special CBI Judge Vimal Kumar in the resumed hearing of the Judge bribery case, the then Solan-based tehsiladar today said he had executed the land deed for 18 purchasers, including Justice Yadav, a day after she allegedly took Rs 15 lakh. The Panchkula Police have beefed up security arrangements for the court hearing of Sant Rampal scheduled to be held at the Punjab and Haryana High Court on November 16. 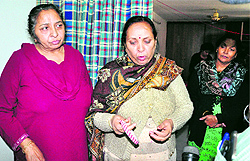 A day after 75-year-old Neelam Saini was found dead at her house in Sector 35, the police suspect that the victim was not strangled but died of shock. Haryana Chief Minister Manohar Lal Khattar inaugurated the online membership campaign of the local unit of the BJP today. In charge of the local unit of the BJP, Aarti Mehra, and city unit president Sanjay Tandon were also present on the occasion. With having around 20 per cent officials of the Mohali police, posted/deputed out of the district or assigned VIP duties, the basic policing has been affected in the town. To beautify the town, the Administration has started roping in local industries. The Panchkula police recovered the Maruti Swift car of absconding BJP councillor Ravi Kant Swami from outside a house in Baltana here this evening. Foot-tapping music, a vibrant atmosphere and programmes showcasing cultural diversity of the country, the Crafts Mela underway at Kala Gram in Mani Majra has been a show stopper. On the occasion of World Diabetes Day, a free diabetes check -up camp and a health seminar on prevention of diabetes was organised by Max Super Speciality Hospital (MSSH), Mohali, at Pushpac Society, Sector 49, today. To address the problems of traders and industrialists and to strengthen the party, the Shiromani Akali Dal (SAD) reconstituted its Beopar wing today. The SAD president and Deputy Chief Minister, Sukhbir Badal, today divided the state in four zones, namely Malwa (1), Malwa (2), Majha and Doaba. A seven-year-old boy who sustained injuries in a wall collapse incident, died today at the PGI in Chandigarh. The fifth edition of the Indian Luxury Expo, a three-day event, was inaugurated at a marriage palace here today. On the 125th birth anniversary of Pandit Jawaharlal Nehru, the Chandigarh Territorial Congress Committee (CTCC) started a two-day festival in Sector 40 today. A senior fellow of the Centre for Public Affairs and Critical Theory, New Delhi, Siddharth Varadarajan, delivered a lecture on the ‘Rising tide of intolerance and what we can do about it’ during the second Chetan Premani Memorial Lecture. City-based Bedi Hospital will organise ‘Celebrating Motherhood Mom & Baby’s Day Out’— at Chandigarh Club on Sunday. Dr RS Bedi, CMD, Bedi Hospital, said it was for the first time in the city that expecting mothers would get a chance to walk the ramp at a special show for them. ‘Any Tym Fitness Centre’ was inaugurated in Sector 40-C on Saturday. Mehak Gupta, the owner of the centre, said it was important that hubs for health and well-being were accessible to all. The Dean, Students’ Welfare (Women), Panjab University has directed the university’s engineering wing to immediately install wire mesh on the top two floors of all six-storeyed hostels to avoid any untoward incident. The School of Public Health, Post Graduate Institute of Medical Education and Research (PGIMER), Chandigarh, organised environment awareness activities today to disseminate information on sustainable and eco-friendly technologies e.g. vermi-composting, reduce, reuse, recycle and recover (4Rs) and how to follow these practices in daily life. The importance of colours, light-emitting diodes (LEDs) and white light was highlighted at a lecture during the 41st Jawaharlal Nehru National Science, Mathematics and Environment Exhibition held at Leisure Valley, Sector 10, today. Chandigarh: Moti Ram Arya Senior Secondary Model School, Sector 27, hosted an inter-school competition to commemorate the death anniversary of Hardayal Mahajan, former president of the JB Charitable Trust. 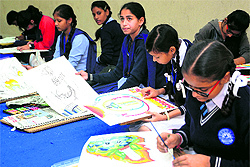 Competitions in paper folding, paper cutting, freehand drawing and computer skills were held. Principal Saroj Savant gave the vote of thanks. Chandigarh: The history department of the MCM DAV College for Women, Sector 36, organised an inter-college debate on “British rule – A boon or bane for the Indian Economy”. 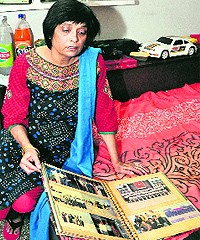 Professor Anju Suri of the Department of History, Panjab University, was the chief guest. The event witnessed an enthusiastic participation of teams from eight city colleges. Bhankhapur village today wore a festive look with villagers attired in new clothes and roads leading to the village decorated with flags. The occasion was a mass-marriage. The court of Additional District and Sessions Judge today acquitted two persons, hailing from Moga, in an NDPS case after the prosecution failed to prove the charges. The two were booked on the charges of carrying heroin. 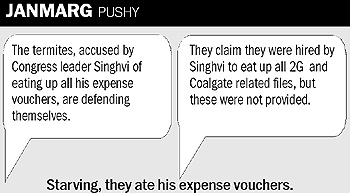 The court acquitted Jograj and Gursharan. A Home Guards volunteer of the Chandigarh Police died after the two-wheeler he was riding slipped on the dividing road of sector 21/34 on Saturday night. Five persons, including a woman, were arrested for attempting to procure a loan on the basis of a fake FDR of Rs 71.55 crore registered on the name of a Delhi businessman, Vijay Aggarwal, today. Two snatching incidents were reported in the city. A resident of Sector 21 alleged that unidentified motorcycle-borne miscreants sped away after snatching her bag containing Rs 1,000 and important documents. The hosts — Government Model Senior Secondary School, Sector 56 — defeated Government Model Senior Secondary School, Sector 40, by 118 runs in the opening game of the junior state women cricket championship for girls (U-19) held here today. In the ongoing seventh Copper Open Cricket Championship, Bedi Cricket Club registered an eight-wicket win over Himachal Cricket Club here today. Akshay and Kanav will face Vinayak and Kevin in the final of boys’ (U-19) category of the ongoing Chandigarh State Badminton Championship for Boys and Girls at the badminton courts of Panjab University. The CGA Junior Golf Tournament culminated at the Panchkula Golf Club yesterday. The Veterans’ Amateur Athletics Association will conduct the 35th Chandigarh Veterans’ Athletics Meet tomorrow at the Sector 46 sports complex.